Backlinks are legitimately considered to be a major ranking factor, and search engines are shifting more and more of the responsibility for the quality of backlink profiles to site owners. So SEO specialists, webmasters and site owners, listen up! You now have a real way to steer clear of Google penalties. We’d like to announce the launch of our new tool — Backlink Audit — for conducting all-encompassing backlink analysis. It includes such features as link disavowal, a smart solution for toxic link evaluation and Google Search Console integration. Backlinks are still a big deal because they impact every site’s rankings. And Google holds every website owner responsible for the quality of their backlinks. A bad or a ‘toxic’ backlink is a link that either comes from a suspicious website, or has been acquired illicitly (e.g., it’s manipulative or spammy in nature). An abundant presence of spammy backlinks will result in tumbling rankings, and those website owners who don’t take proper care of their sites risk getting penalized by an algorithmic or manual action. A flawed link audit can also have detrimental implications. So, waiting for the next Google’s update to slay your rankings in SERPs isn’t your best bet. This is where the SEMrush Backlink Audit tool steps in and helps you swing back the penalty pendulum. What is the SEMrush Backlink Audit tool? Let’s take links in comments sections, for instance. According to the Google Webmaster Guidelines, links in comments are very likely to wave a red flag to Google. Especially when there are quite a few of them in the comments section. This should really go without saying, but a referring domain’s category has to associate with the same category of the source domain. If the category of those two types of domains is tangential to one another, that’s a bad sign. For example, if your website is about Mexican cuisine, it’s going to look odd if you are recommended by an auto dealership site. When it comes to link networks, we look for them based on AdSence ID, Google Analytics ID, IP, ‘whois’ data and other signals. Another example of such links would be mirror pages, a.k.a. duplicate content pages. You know those directory websites that list hundreds and thousands of domains on a page in a neverending list? Yup. If a domain somehow ends up on such a list directory, domain’s trust score could be in danger. If there are malicious or de-indexed domains that refer to your site, this automatically makes your website a hazard in the eyes of Google. Moving further, we conduct level-based link, page and domain analysis. Then we analyze toxic markers’ frequency (how often this or that marker has been discovered) and build a toxic score formula that identifies the toxic level of each link compared to all others. 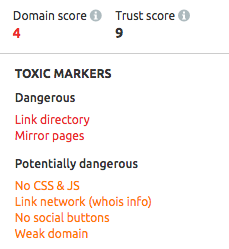 Once SEMrush has analyzed all your links, it will give you a list of backlinks sorted by toxic level. You can then group the ones you wish to disavow so that you can submit them to the Google Disavow tool. SEMrush can submit the list for you if granted access to your Google Search Console. This procedure will help to prevent the domain’s rankings from being impacted by Google’s sanctions, or to take proactive actions when dealing with consequences. You can monitor your backlinks’ profile on a regular basis and quickly disavow those links that may have a harmful impact on your rankings. In a worst case scenario, you will receive a notification in Google Search Console informing you that your website has been penalized. The SEMrush Backlink Audit tool will show you which sites are giving you toxic links with the option of reviewing specific links separately. You can then reach out to website owners with toxic links and request that they remove them. If you connect your Google Search Console account with your SEMrush account, you can scan a greater number of backlinks. To get started, go to SEMrush Projects. If you already have at least one active Project running, you'll notice a new section there called 'Backlink Audit Tool.' Go ahead and click the 'Set up' button to configure your first Backlink Audit campaign. If you’re new to SEMrush Projects and need a hand with getting started, check out this article. Our carefully crafted user manual will guide you through all the steps for setting up your Backlink Audit campaign. While this tool is in beta, we hope to receive as much feedback as possible in order to improve its functionality. We are already working on a few neat features, but we want to know what kind of improvements you’d like to see most. Feel free to send us your comments, questions and suggestions to [email protected]. Perform an extensive backlink audit using SEMrush’s reliable automation now!